Making yoghurt is one of the simplest things you will ever do. Trust me. If you have a large family that loves the stuff, it will also be one of the most frugal things you ever do. Indeed, once you’ve got the process down, you can start getting them to take over from you. The key to all of this is to remember that yoghurt has been around since the Stone Age. Mind you, there’s a few things we do for safety now, that weren’t done then – and our implements look a little different – but it’s still pretty much the same. All of which means that it’s pretty much idiot-proof. To make yoghurt, you will need milk (cow’s milk, goat’s milk, soy milk) and either culture or starter. This post will use starter. Find a plain yoghurt you like and that can be your starter. Hard, isn’t it? Okay, I’ve been told to be more serious. Ahem. All yoghurts contain bacteria which have digested the natural sugars in the milk and helped to transform the proteins. (For more detail read Yoghurt 101.) When you decide that you wish to try making this all happen under your roof, you’ll need to start by getting yourself some yoghurt. In the chiller section of the supermarket you will find myriad yoghurts ranging from low-fat to sugar-free and everything in between. What you need to look for is a small tub of natural yoghurt. When you find one, look at the ingredients label. It should contain nothing more than milk, milk products and cultures. If your label says live cultures, then that’s even better. You don’t need anything that has stabilisers or food numbers on it. Those ingredients are used to thicken the final result. They often do not have the required numbers of bacteria in them and, if you were to use that product as your starter, you would end up with something that resembles cultured buttermilk and you would hate me forever. Don’t do that. 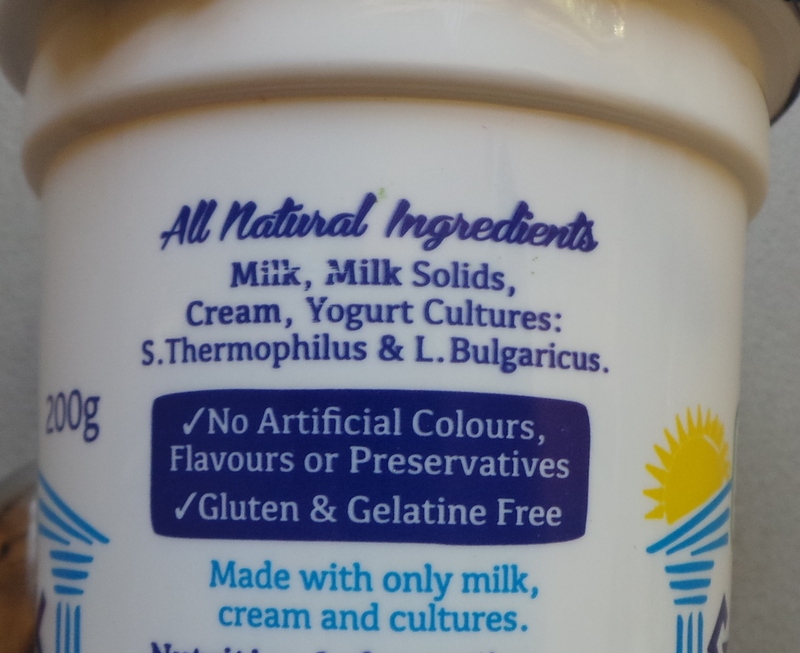 Also, be aware that Greek yoghurt is not only a type but is also a method of making yoghurt. Use it as your starter by all means, but it will not set firmly. 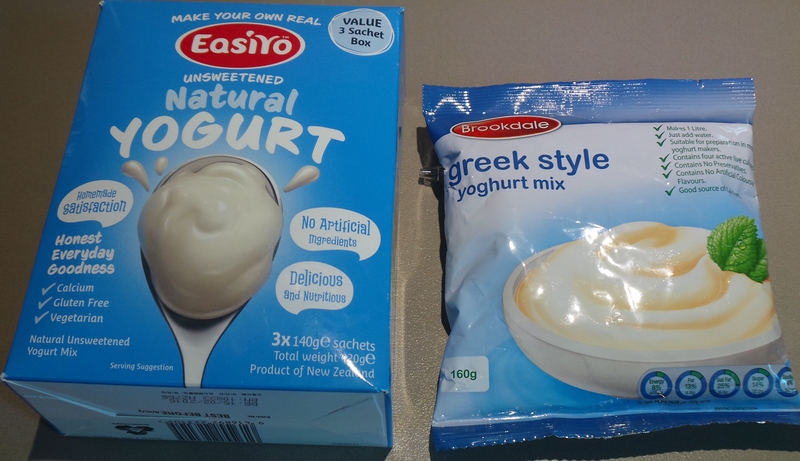 If you prefer the taste of Greek yoghurts to those formed with L.acidophilus then make your yoghurt from it, but know that it will require straining to achieve the firmness of the yoghurt in the tub you have purchased. If you find locating something this simple and unadulterated difficult to do, then try using a packet mix yoghurt for your first shot and putting aside some of that as your starter. Be pragmatic. As an aside, there is nothing intrinsically wrong with using powdered mixes like these. Just be aware that they also use stabilisers – which can exacerbate some allergies. Also, there is no budgetary advantage to doing so. A packet of yoghurt mix costs around AUD$4.50 as does a litre of yoghurt at the supermarket. A litre of milk costs $1 or so. If you have several children eating several kilograms of yoghurt a week, making your own from scratch is much more economical. Yoghurt will last for quite some time when properly stored in a refrigerator, but you need your starter to be relatively fresh so check the dates on any fresh yoghurt you may buy. Next, you will need to get your milk and equipment all in the one place. something to keep your yoghurt warm in. Make sure everything is as clean as possible. The only bacteria you want to grow is that in the yoghurt culture. Now, heat your milk. If it is raw milk it is safest to bring it to a boil (at least 85°C or 180°F) and then let it cool to the desired temperature. If you do this on the stove top, use a large saucepan and watch it carefully to avoid having the milk boil over. Otherwise, you can heat your already pasteurised milk in the microwave using a large Pyrex jug – which is my preferred method. I heat my yoghurt in the microwave, using a large pyrex jug. It’s much easier to wash up the jug, I find, and then pouring it into the container in which I want it to ferment is much easier than pouring it from a saucepan. One litre of milk straight out of the refrigerator needs only 3-4 minutes on HIGH in my microwave and then I can place it on my counter and wait for it to cool down. 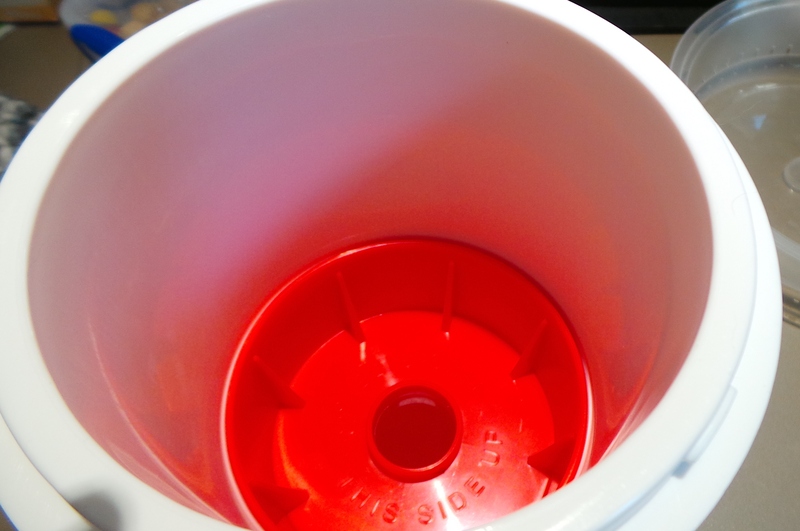 Allow your milk to cool to between 47°C (116°F) and 32°C (90°F). You can use a thermometer to test this or wash your hands and use a finger – since the Stone Ages, remember? – dip in a finger and count to ten, the milk will feel uncomfortably hot, but bearable. This is important. Yoghurt bacteria are like yeast. Too hot and the bacteria will die, too cold and they will remain dormant. While you are waiting for your milk to cool, place two dessertspoons of your starter culture into a small bowl. A good rule of thumb is one dessertspoonful (2 teaspoons) of starter for each 500ml of milk. Pace your starter culture into a small clean bowl. 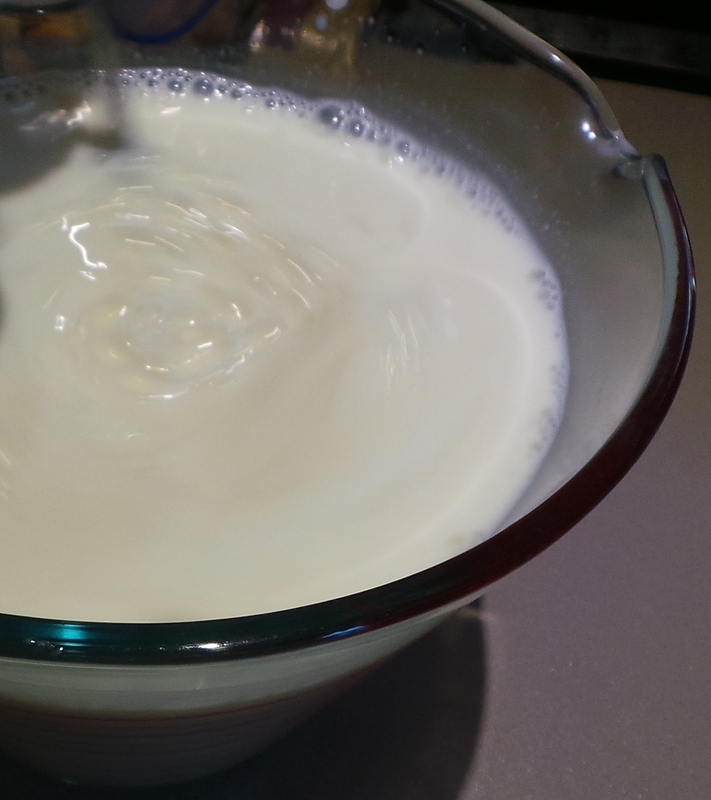 Then, when your milk has cooled sufficiently, place half a cup or so into the bowl and whisk well. You want the result to be quite smooth. Blend your culture thoroughly into a small amount of warmed milk. It won’t break, there’s no need to be delicate. 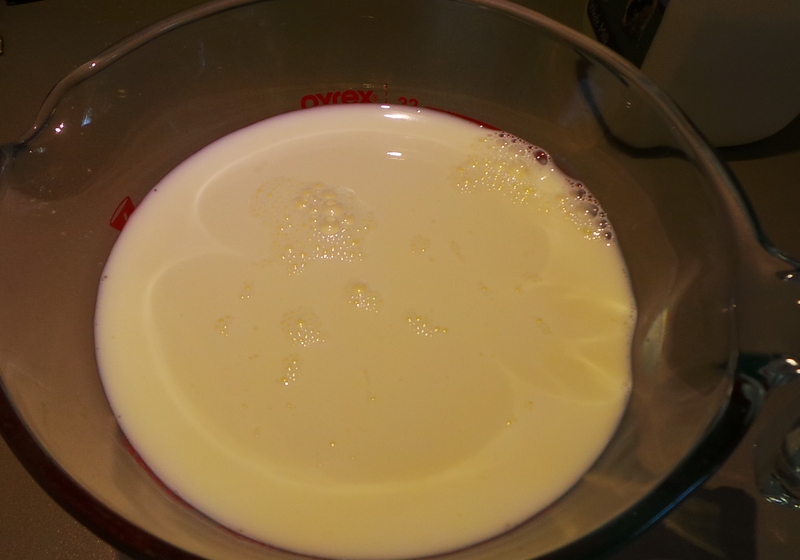 Now reintroduce the liquid in the bowl to the rest of the warmed milk, again blending well. Introduce your culture mix to the rest of the milk and blend well. You’re pretty much done. Now all you need to do is maintain the temperature for 6 to 8 hours. My mother used to put the mix in a bowl with its own lid, wrap it in a towel and place in on the internal water heater overnight. I know some people swear by placing their yoghurt into an oven with just the pilot light on. You could place it into a thermos or vacuum flask. Some place their heated milk into a preheated crockpot or slowcooker. To do this preheat your slow cooker on High but switch it off when you add your yoghurt mixture and then wrap the whole thing in a towel overnight. You could place your sealed container into a foam insulated box, esky, cooler box or chilly bin with a filled hot water bottle for company. 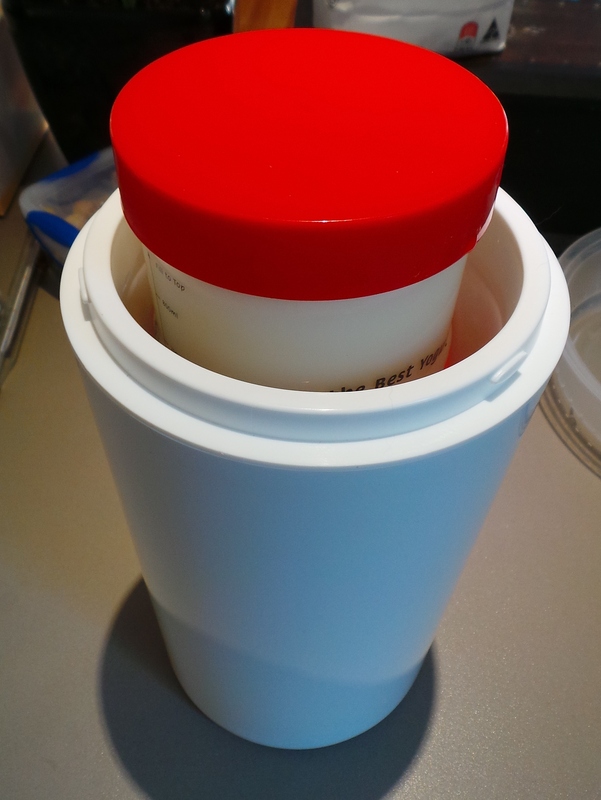 I use a commercial yoghurt making device that is a simple, plastic-covered foam flask. I place my yoghurt mix into a plastic container with a screwtop lid, half fill the flask with boiling water, pop the container in, put on the lid of the flask and leave it overnight. You simply half fill it with boiling water. Add boiling water and then your yoghurt mixture. I like using this because it’s so convenient. Firstly, I can simply take the set yoghurt out in the morning, wipe off the container and put it in the fridge as it is. Secondly, the flask itself takes up very little room and can be popped in a corner, on the dining table or anywhere else with very little trouble. I will be offering one of these in a competition for my readers in the next few days. I also like not having large containers of warm liquid to juggle (and most likely spill everywhere). 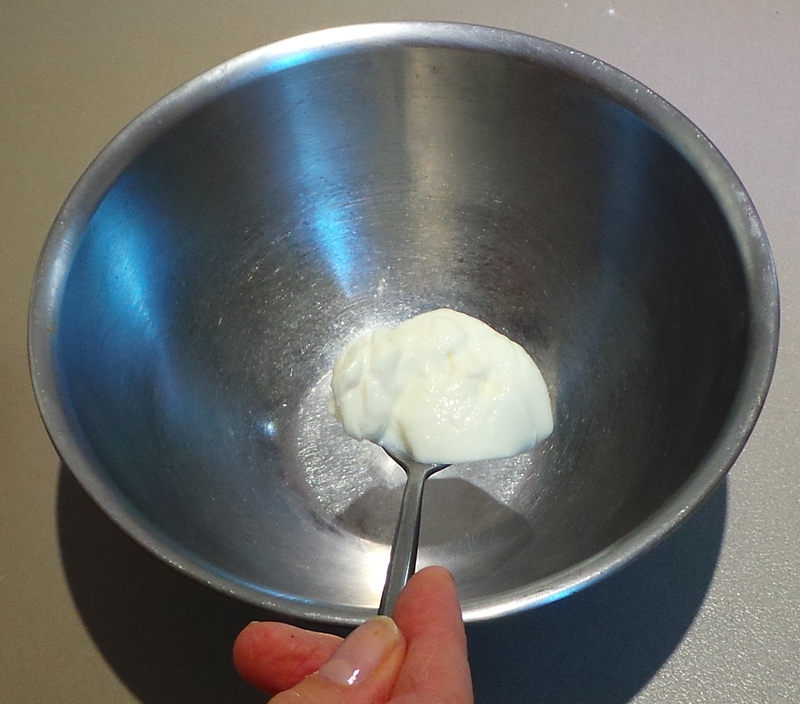 It is far better to make smaller amounts of yoghurt often, rather than large amounts infrequently. Your yoghurt depends on the freshness of the starter culture so, if you keep your own stocks ticking over, you will be able to continue using your own yoghurt as a starter for longer. It’s also easier to cope with a litre or two at a time in your refrigerator than it is to cope with a gallon of it. Trust me. Make up your yoghurt of an evening and it will be ready for the refrigerator first thing in the morning. Try not to leave it to ferment for any longer or it will become quite sour. Go about your day and let it set – leave it alone. That evening it will be ready for you to strain off the whey, divide for portable lunches or breakfasts, flavour or use in other recipes. Just remember to put a few spoonfuls aside to start off your next batch! I will be posting a few ideas for how to use your yoghurt in the near future. Rinse all equipment in boiling water to sterilise. Heat-proof glass mason jars with loose fitting lids are ideal for incubating and storing your yoghurt. 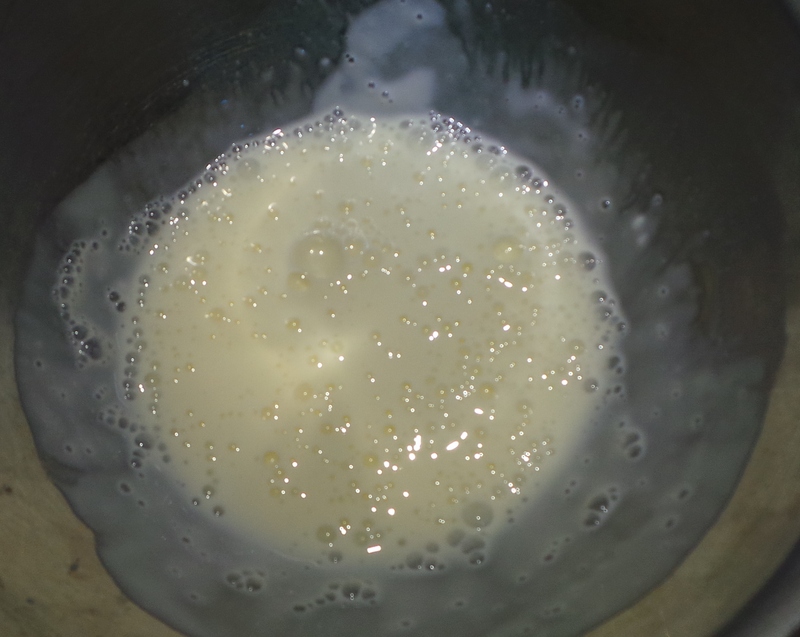 Pour milk into a saucepan and then blend in the powdered milk until thoroughly dissolved. Bring gently to a boil. Remove from the heat and allow to cool until tepid – 45°C. Place your culture into a small bowl and add ½ a cup of your cooled milk. Blend well with a fork or a whisk. Reintroduce this mixture to the rest of your heated milk. Again, stir well. Pour the culture mix into an incubating container and keep warm for at least 6 hours. Do not disturb your yoghurt while it is setting! 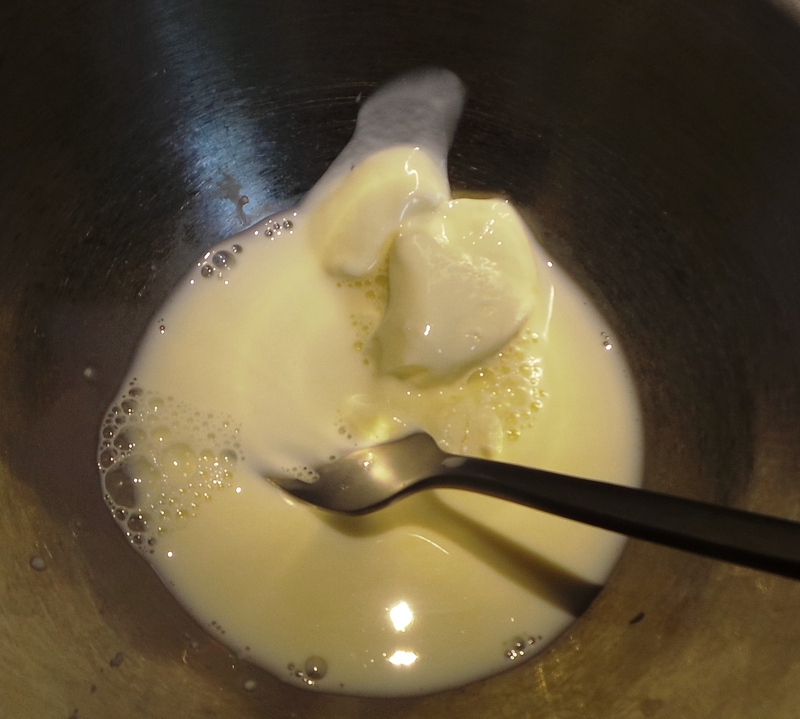 When the yoghurt is set it will have a thin layer of clear, yellowish liquid surrounding it. This is whey and is perfectly normal (and edible). Place your containers into the refrigerator to cool and set more firmly. 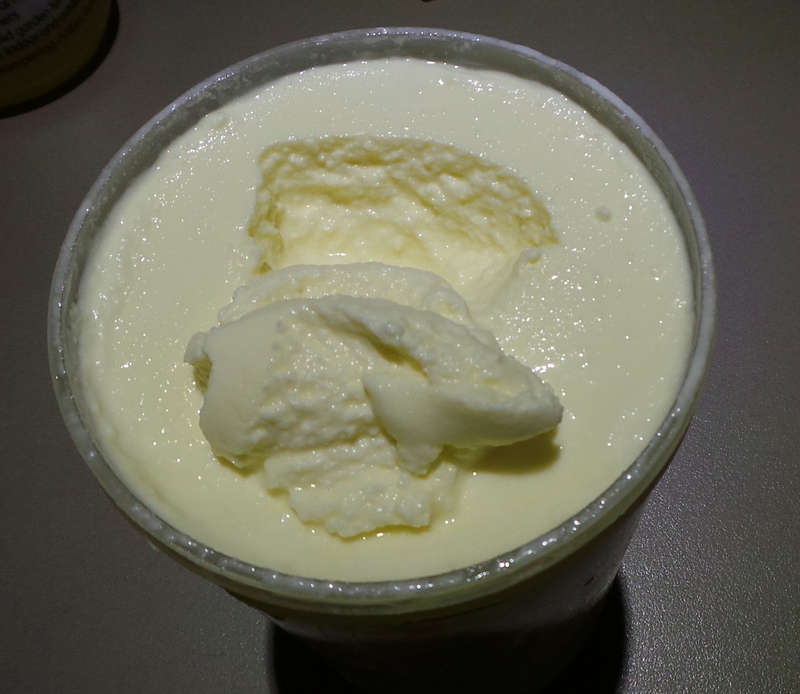 When you wish to eat the yoghurt, you may stir in the whey (it is high in protein) or strain. Reserve several tablespoons of your yoghurt to act as your starter in your next batch.